A new jailbreak tweak makes it possible to change between sending an iMessage or a text message instantly, without having to venture into the Settings app, or wait for the message to fail first. SwitchService, available to download for free from the repo.ioscreatix.com repository, needs just one long press to change between iMessage and SMS, and it’s awesome. If you live in an area with spotty reception or move in and out of buildings that are somewhat like Faraday cages, then you will be all too familiar with the problem of hitting send on an iMessage and then seeing it stall because your iPhone doesn’t have a data connection. If you’re lucky, iOS will realize what is happening and revert to SMS, but in our experience, that doesn’t always happen, even if you have the option flicked on in the Settings app. What you need is a nice, easy way to change between sending iMessages and text messages on the fly – no settings, and no messing around. That’s what SwitchService does. 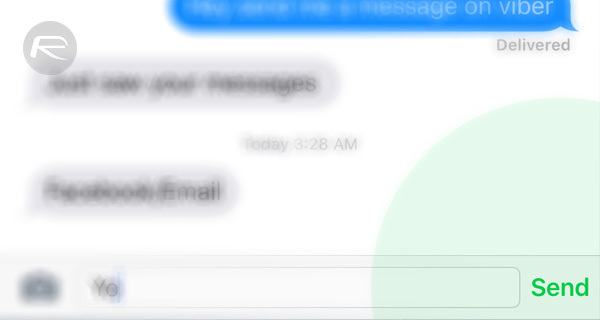 Once installed via Cydia, the tweak allows users to tap and hold on the Messages app’s Send button in order to switch between using iMessage or SMS before sending the message at hand. The beauty of this solution is that you need never leave the Messages app and you can switch between the two protocols on the fly. This is a feature that was part of the much loved BiteSMS Messages app replacement, and it’s now here as a standalone tweak with support for iOS 9 to boot. The tweak is free too, which should very much reduce the barrier of entry here. If you are carrying a jailbroken iPhone and find yourself sometimes needing to fall back to SMS when sending iMessages, then we think SwitchService may just be the thing for you. Why not just give it a try for yourself? To download the tweak, you’ll have to add the aforementioned address for the Creatix repository to Cydia from Sources > Edit > Add. or just type the message as an iMessage then as it sends press and hold it and choose “send as text message”? so it’s a tweak for people who don’t know how to use their phone??? Sachin is a professional troll. only thing about this tweak – i haven’t used it for myself – is that i don’t know if it has “send as sms/mms by default” like msgserviceswitch does. i’m satisfied with the latter anyway. works like a charm.